Rovio reveals a trilogy pack with updated HD graphics and new cutscenes. For anyone who hasn't played one of the many, many iterations of Angry Birds on mobile and browser platforms, there are going to be a few new places to get your aggravated avian fix. As teased back at E3, Activision is helping Rovio bring the popular slingshotting games to consoles - specifically, the original game, Seasons, and Rio are being packaged and shot towards the PS3, Xbox 360, and Nintendo 3DS this holiday. 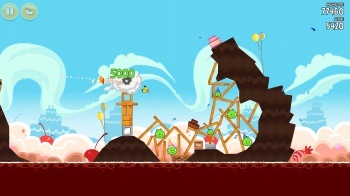 The game, called Angry Birds Trilogy, won't be quite the same as the originals. The graphics have been "re-treated for the high-resolution and big screen," according to Rovio's Executive Vice President of Games Petri JÃ¤rvilehto. Rather than just an HD update, improvements include animated and even "reactive" backgrounds, lighting modes, and new cinematics. JÃ¤rvilehto didn't say if players would get the free levels bestowed upon iOS and Android fans, but the levels that are included will have their own individual leaderboards. The game will support Kinect and Move on their respective consoles, and the 3DS' unique device-to-device StreetPass feature, though details on the latter are currently scarce. The gravity-bending and exceeding popular Angry Birds Space is the only Angry Birds game to not make an appearance in the trilogy.